The CoorsTek Center for Applied Science and Engineering at Colorado School of Mines will welcome its first students in January 2018, a significant milestone in a multigenerational partnership between Mines, the Coors family and CoorsTek, the world’s leading engineered ceramics manufacturer. In advance of the center’s completion later this year, CoorsTek and Mines hosted alumni, industry partners, government leaders and the campus community Sept. 28 for a ribbon-cutting and preview of the $50 million world-class research and teaching facility as part of the school’s 2017 Homecoming festivities. 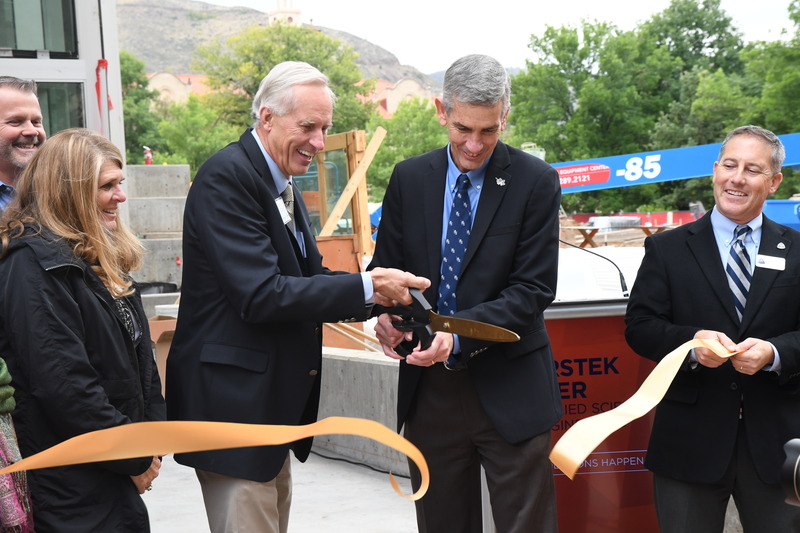 In 2014, CoorsTek and the Coors family announced a $27 million commitment to fund a new research partnership and construction of a modern research and teaching facility at Mines. The investment is the largest single private commitment in Mines’ 143-year history and expands upon a longstanding academic, research and career opportunity partnership between CoorsTek and the school. The state of Colorado provided $14.6 million in funding to enable the building’s construction. The CoorsTek Center will be the hub for collaboration at Mines, housing such innovative campus-government-industry partnerships as the Mines Materials Institute and the Alliance for the Development of Additive Processing Technologies (ADAPT). 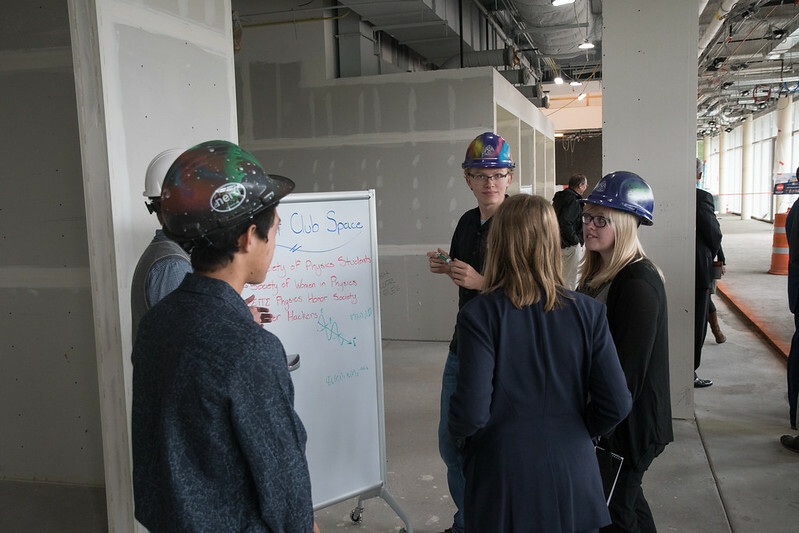 Some of the most groundbreaking research on campus will happen inside its labs, including the Quantum Theory Lab and the Advanced Characterization Lab. The facility’s flexible laboratories and customizable classrooms will also support the College of Applied Science and Engineering, further fostering the highly collaborative partnerships among its four departments and two interdisciplinary programs: the Department of Physics, the Department of Chemistry, the Department of Chemical and Biological Engineering, the Department of Metallurgical and Materials Engineering, the Materials Science Program and the Nuclear Science and Engineering Program. In addition, the Physics Department will call the building home. The College of Applied Science and Engineering attracts $24 million in research funding annually, including support for nationally known centers such as the Advanced Steel Processing and Products Research Center, Colorado Center for Advanced Ceramics, Colorado Fuel Cell Center and the Renewable Energy Materials Research Science and Engineering Center. Designed by internationally renowned architecture firm Bohlin Cywinski Jackson and Denver-based Anderson Mason Dale Architects, the CoorsTek Center for Applied Science and Engineering is located on the site of the former physics building, Meyer Hall, at 1523 Illinois St. The project’s general contractor is FCI Constructors. CoorsTek makes the world measurably better as the partner of choice for technology and manufacturing companies worldwide whose success requires the unique, high-performance properties of products manufactured from engineered ceramics and advanced materials. CoorsTek products and components touch people’s lives through amazing solutions to global challenges in energy, transportation, information technology, health care and defense, among others. For more information about CoorsTek, including product information, its history since 1910 and locations throughout Europe, North America, South America and Asia, visit coorstek.com. Colorado School of Mines is a public university focused on science and engineering, dedicated to pioneering research that addresses the great challenges society faces today and committed to educating students who will do the same. Founded in 1874 as an institution specializing in silver and gold, Mines has expanded its mission beyond the extraction and use of natural resources, becoming a world leader in advancing responsible stewardship of the Earth and developing revolutionary technologies in numerous disciplines. Learn more at mines.edu.